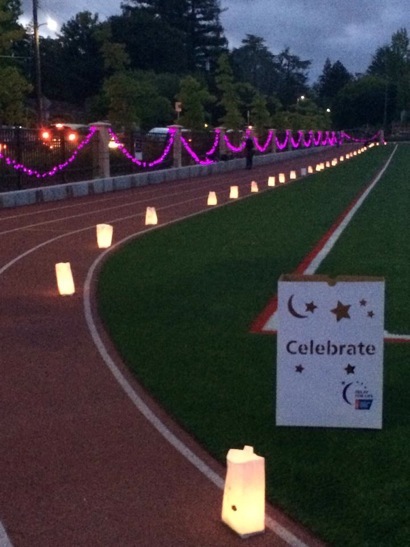 On Friday night, May 15, 2015, Hillview Middle School created a first-time ever event for the American Cancer Society — a Glow in the Dark, three hour Relay for Life walk/party from 9:00 pm to midnight to bring awareness and support to the cure for cancer. The amazing 6th, 7th and 8th grade Hillview students raised over $24,000! Parent leaders, Robin Buckley and Roxy Bozdog with Elise Kratzer, President of the Hillview Student Service Club, organized the event with the Relay for Life team in less than two months. Special thanks to the Waldron family for their lighting talent — parent and student volunteers decorated the track with 5,000 purple and green lights, black lighting, and colored flood lights. Huge thanks to all the parents and students who volunteered, participated, and sponsored teams!